Creativity, perhaps more than any other aspect of life, depends on the extent to which the brain is able to work coherently as one whole. In scientific circles this is also referred to as “whole brain creativity”. This can be measured through EEG coherence measurements, and transcending, more than any other experience ever researched has been found to increase EEG coherence (see transcending = development of full brain potential). 362 Taiwanese school children were randomly divided into 4 groups: one TM group and 3 control groups: one group in which students could take a nap, one group that practiced contemplation meditation, and one group in which students were not given any specific attention. 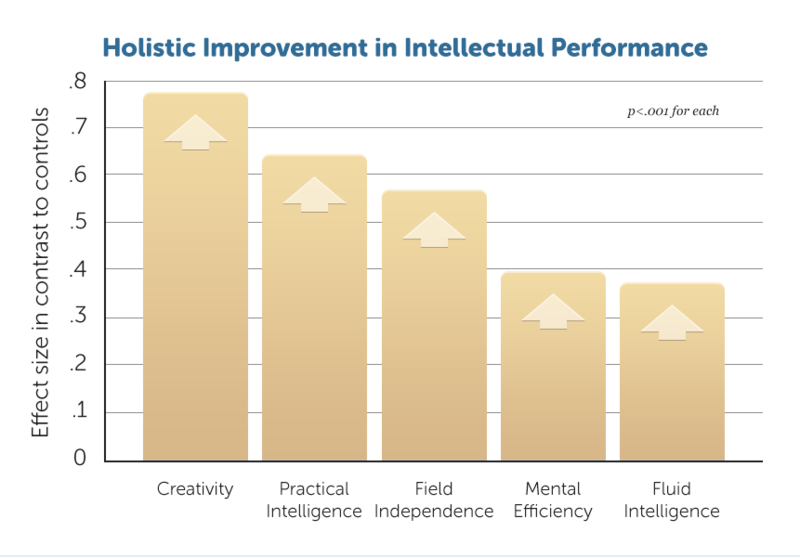 After six to twelve months a highly significant improvement was noticed in the TM group, as compared to the 3 control groups, in all 5 scales of intellectual capabilities, including a scale for “whole brain creativity”. The difference in growth in the control group was so big and so consistent, that the p-value was 1 in 12.5 billion. p=0,0000000008. (what is a p-value?). Scientists are normally impressed with 1 in 20 (p<0,05) and the smaller the p-value the more impressive the result. The TM students also showed a significant reduction in stress symptoms. Perhaps even more impressive is an experiment in which children practiced TM throughout their school careers, as part of their school curriculum. These children have won the world championship in Creative Problem solving 4 times already, despite the fact that each year over 100,000 of the world’s most creative students participate in this competition. (see TM in education).